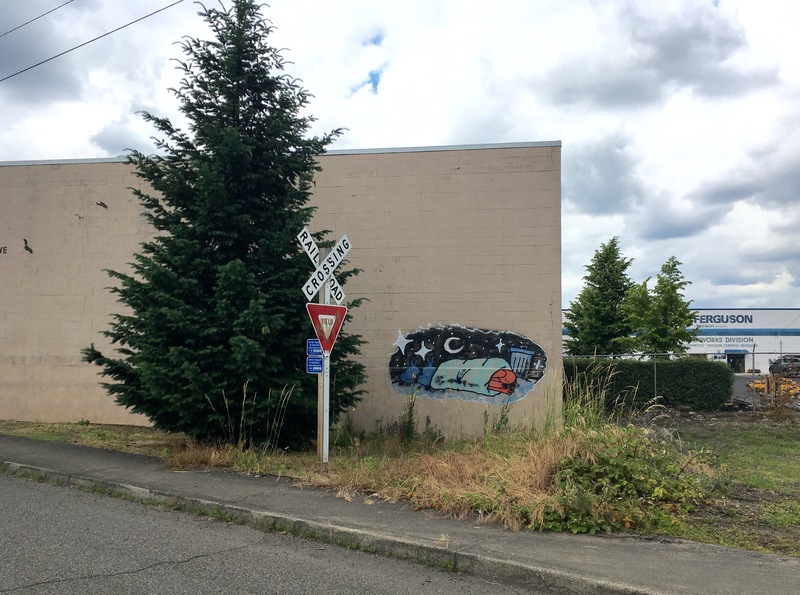 The Portland Orbit will be on hiatus due to a biking accident. 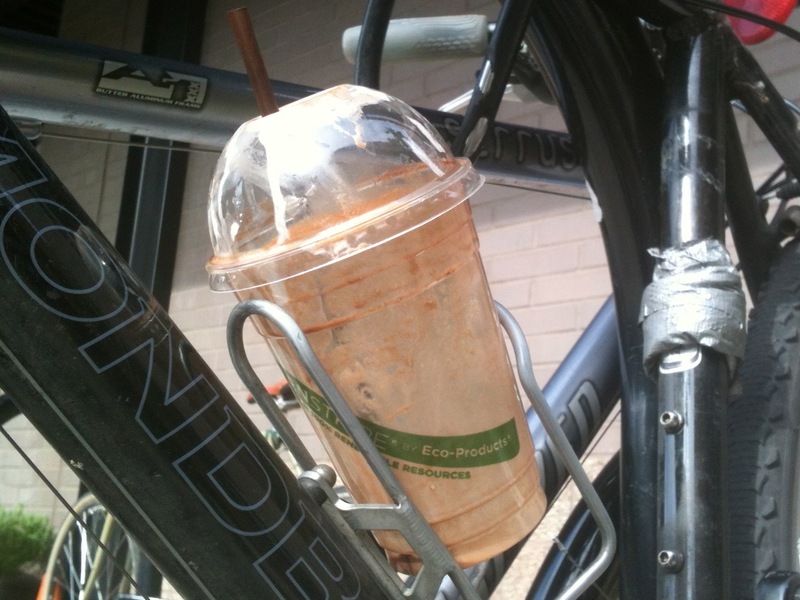 This blogger will return to action when he regains use of the left side of his upper body. You enter a dimly lit room with a high ceiling and sit at one of the many tables in an otherwise empty space. You become mesmerized by twinkling lights that swirl and cut through the darkness. Shimmering curtains in the back of the room are made of mystical, metallic material. A soundtrack of a loud, sweetly distorted guitar solo fills the still air. Your eyes fixate on a single pole that appears in a spotlight. Out saunters a dancer in a leather bikini with fringe hanging from the waist band, being quite naive, you had no idea they made those. Her hips sway as she moves like the star of an alternate culture ballet. She approaches the pole, reaches up with both hands and wraps one thigh high up and around. 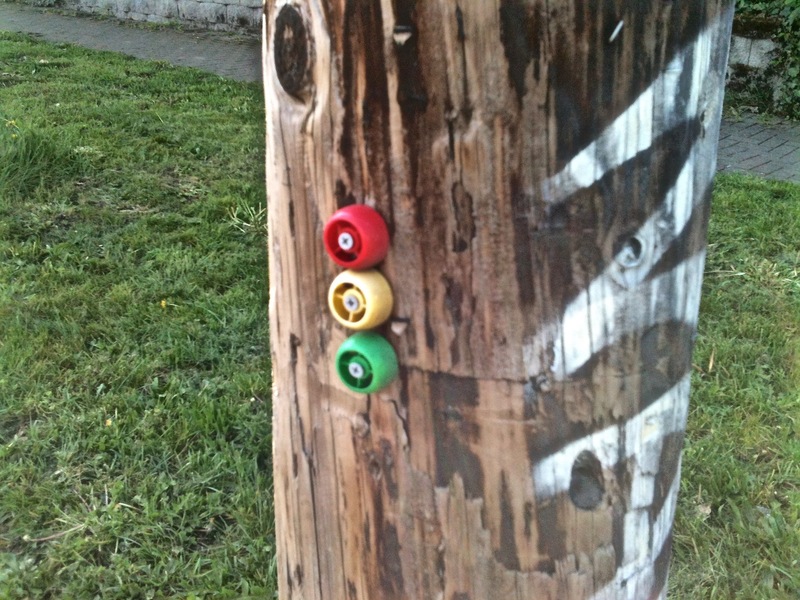 Your mind drifts to another kind of pole art. You can’t help it. 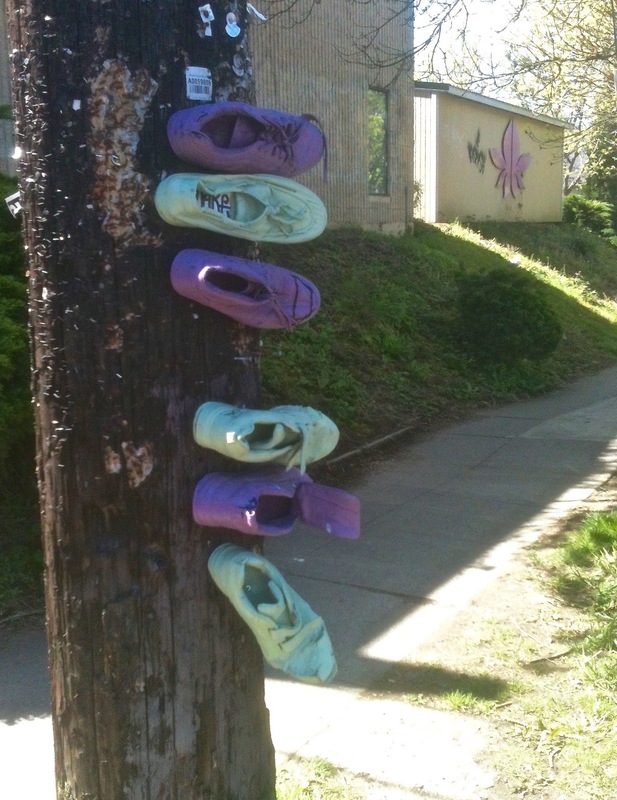 It seems strange but it started with shoes attached to poles and you saw more examples of it and had been trying to figure it out. 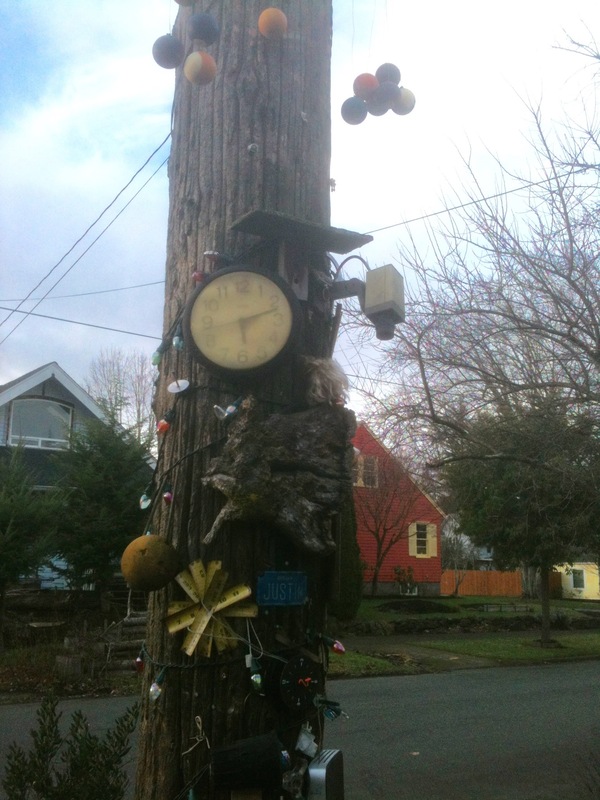 It occurs to you that there is no way to know what qualifies as a true example of pole art. 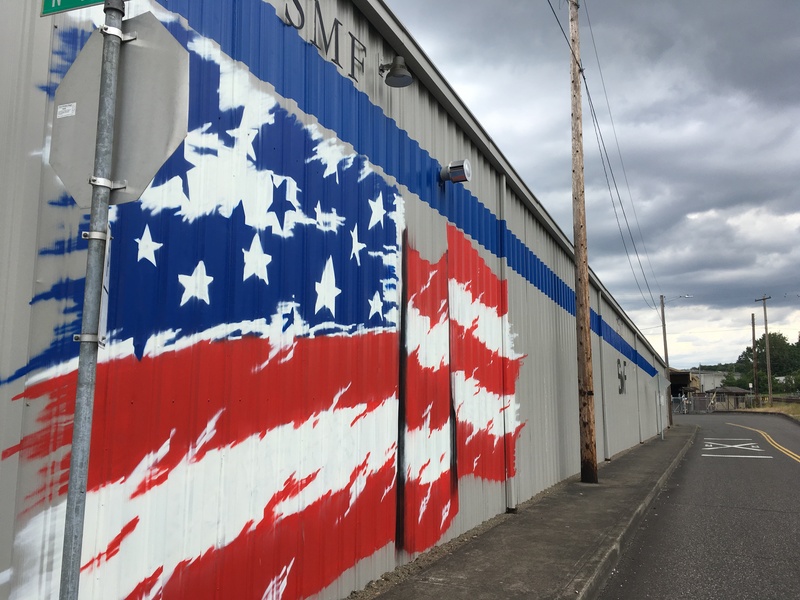 You’ve never been sure, at least not sure enough to expect to have telephone poles dragged into the Portland Museum of Art for a major pole art retrospective from the last two decades. 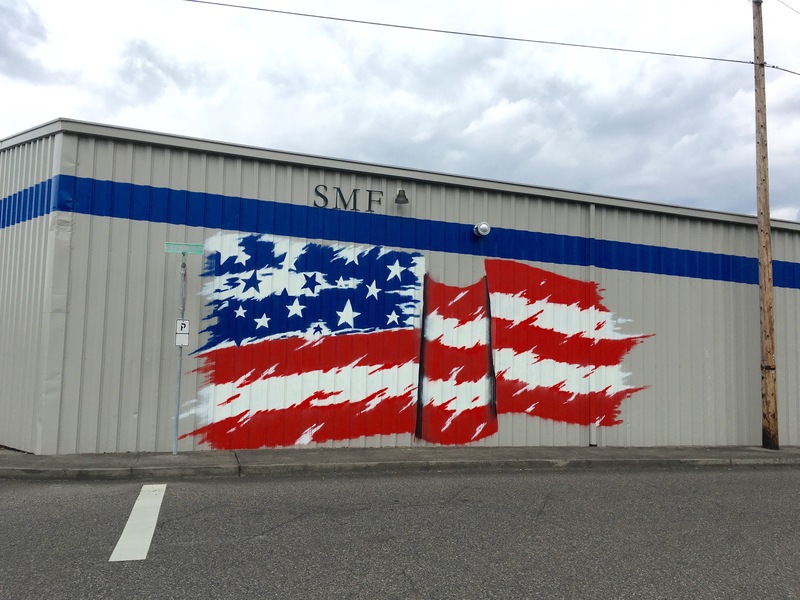 Besides, pole art is anonymous and more in line with street art. A pounding drum solo disrupts your revery. A dancer lies in a concentric circle at the bottom of the pole. All of your money has leapt out of your wallet and remains crumpled up on the floor. A bouncer is tapping you on the shoulder and tugging at your collar. 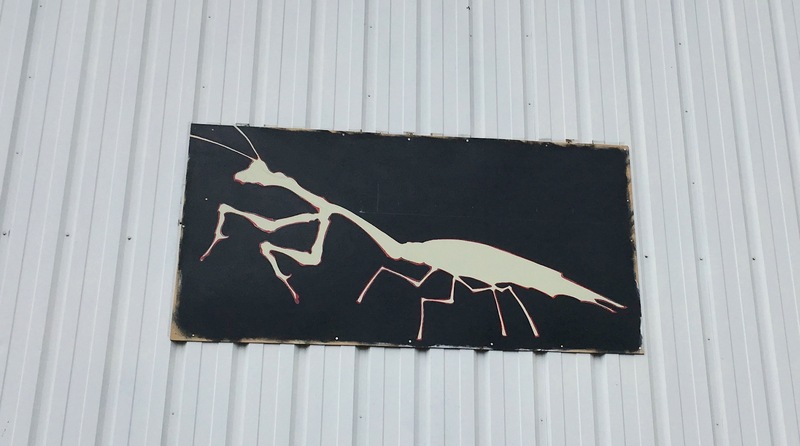 You long to escape to the purity of this other world, a different kind of pole art. The versatility of poles is evident in their ability to hold up wires and display art. 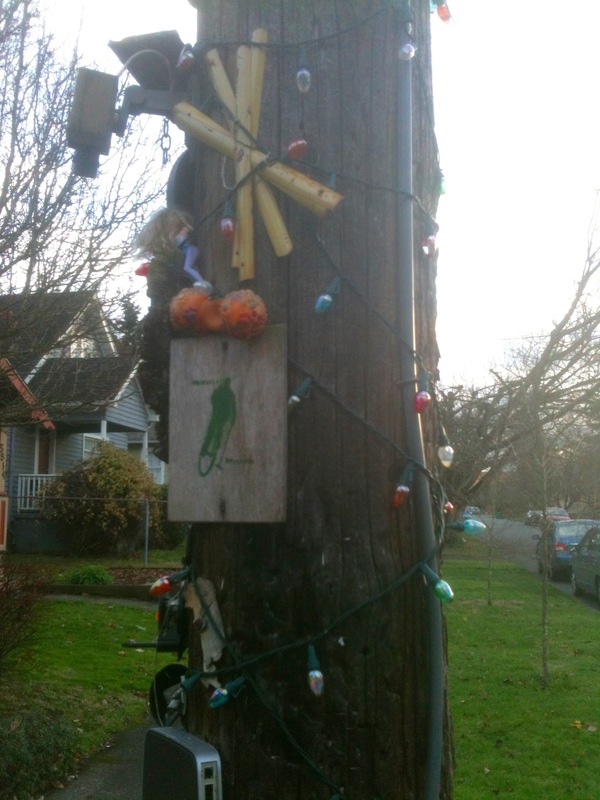 One of my earliest recognitions of pole art was found in the Arbor Lodge neighborhood. 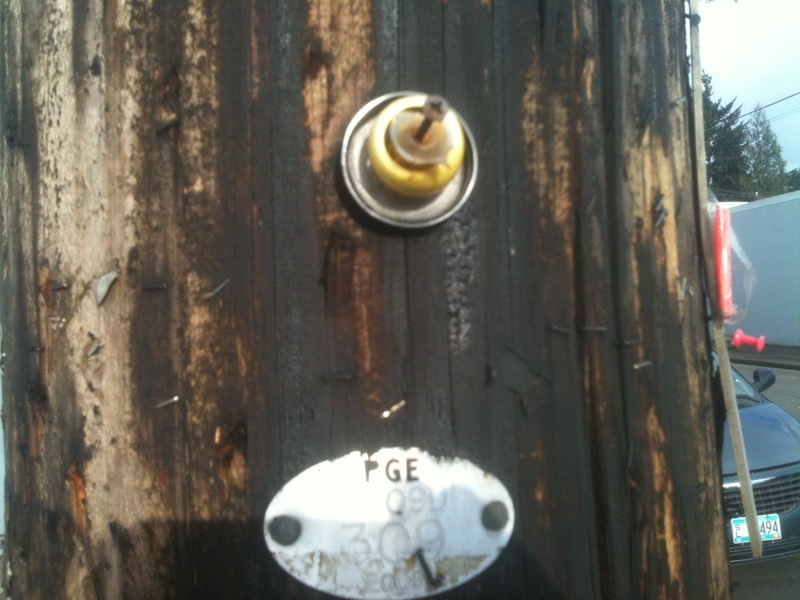 The exact street has been forgotten, but I saw it off Ainsworth St. Others might describe it as found objects affixed to a pole–more eyesore than art which may be getting us closer to a pole art definition. 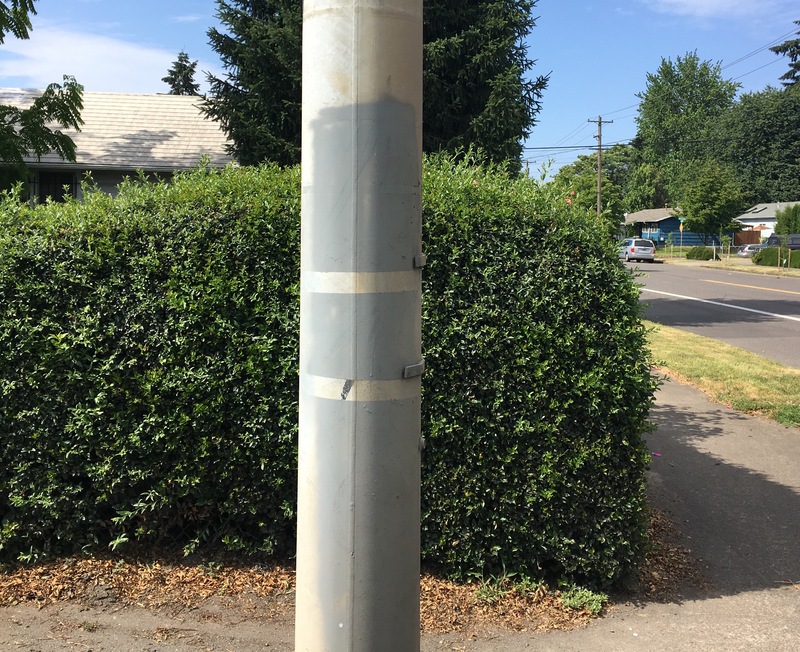 As a resilient repository, poles can withstand nails and staples and suffer through affixations of flyers, poster hangings, spray paint, street signs and other displays. There are the times when it’s hard to say what artistic statement is being made or if the attempts at art are serving an actual purpose. Gizmos like the screwed in plastic gadgets, have a function that is anyone’s guess. They resemble bottle caps. 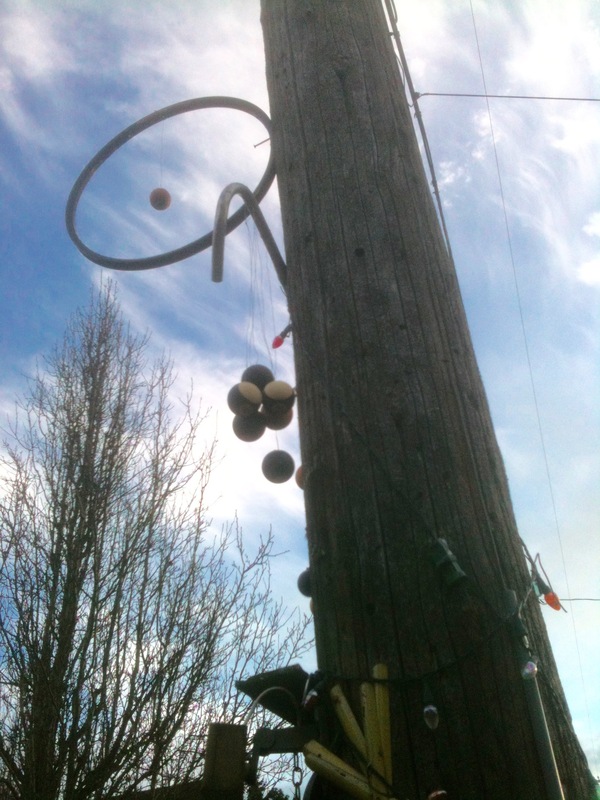 It’s hard to imagine the concept behind anyone wanting to screw something into a telephone pole as an artistic statement. I lean towards them having some functional use because I’ve seen similar devices on other poles. They do spruce up an otherwise dull piece of wood though. 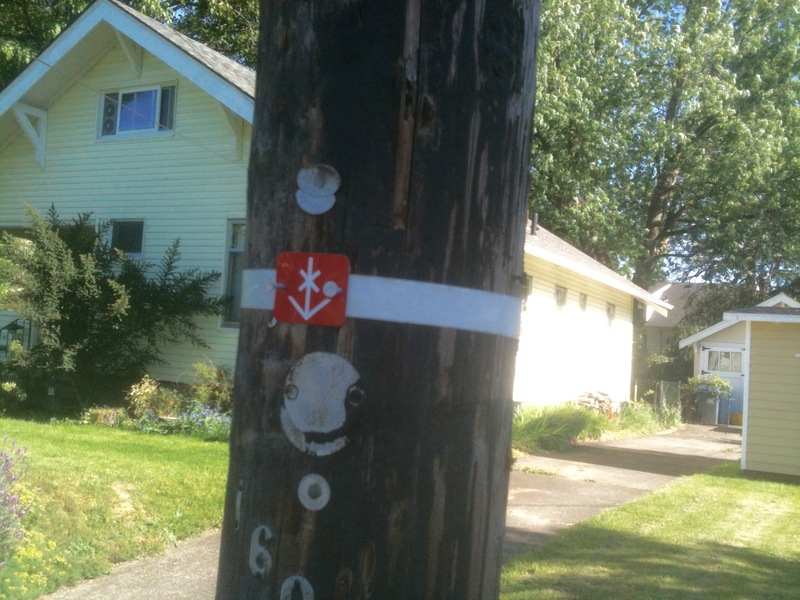 I’m not sure who is trying to dress up the poles around here, but the nailed in, red, star flower symbol with a strap is really jazzing up the look of the poles in my neighborhood. It means something to someone and something entirely different to someone else. I know, ah, it’s that similar feeling when a show ends with a to be continued message. 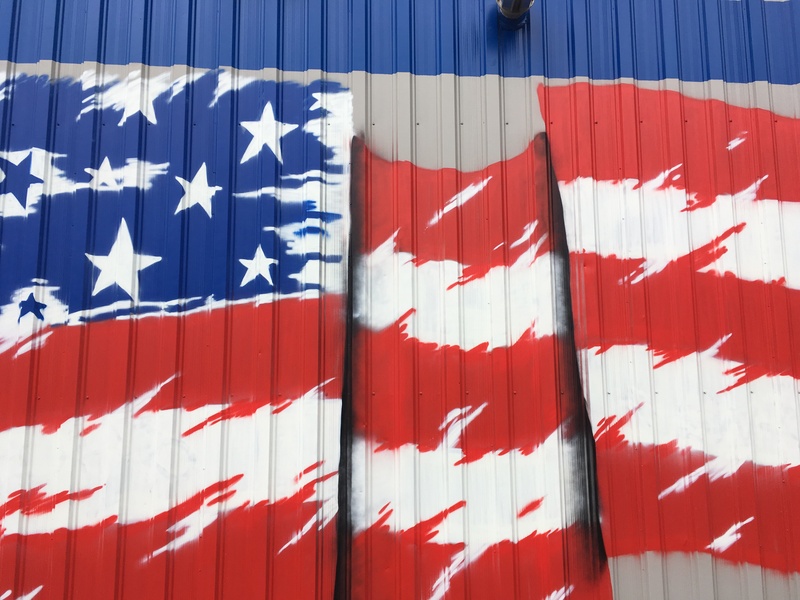 There’s so much more coverage concerning Pole Art that it will have to be continued. I apologize for the difficult week you will have to endure as you wait and wonder about what else can be written on the subject matter. Tune in for part 2 anyway and be glad you only have to wait a week. 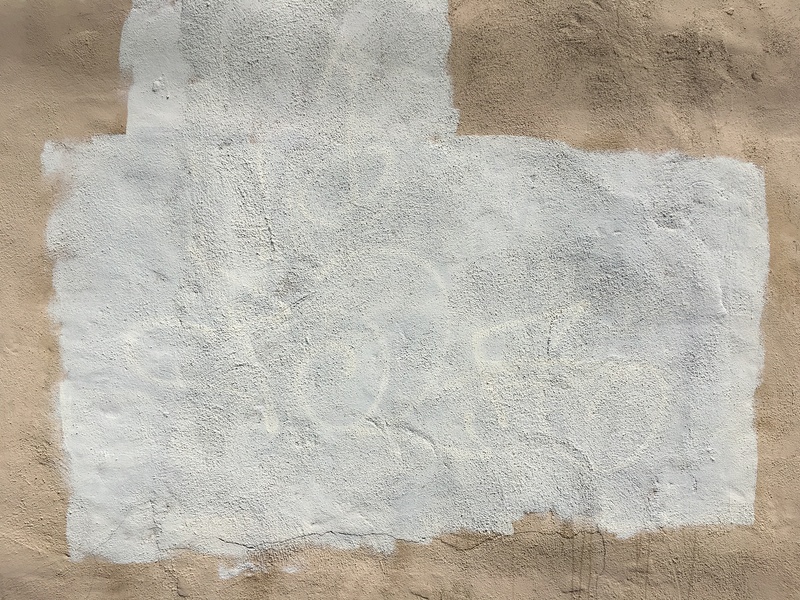 From that post, I recognized the local angle of the Rothko style graffiti cover-up. Mark Rothko, the abstract expressionist painter, lived in Portland during his youth. 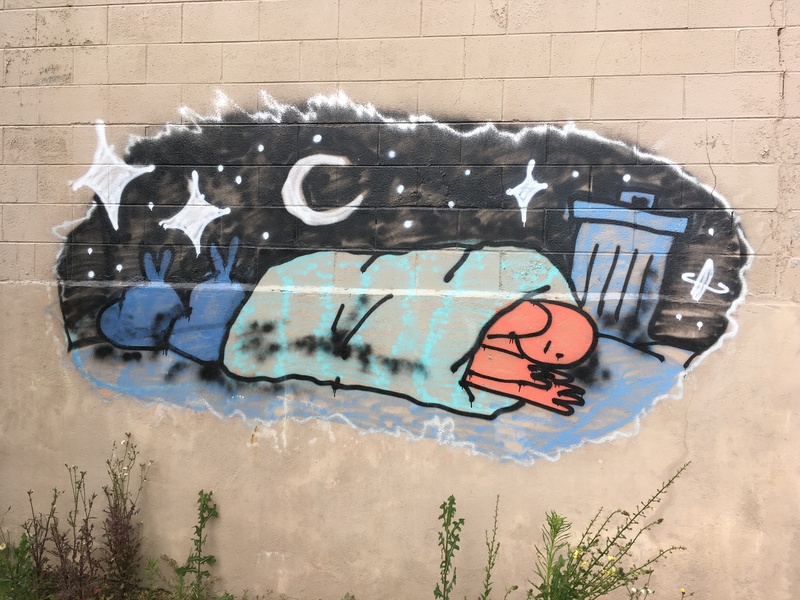 Not to make light or be too simplistic, but it seems like growing up with Portland’s dreary rainy season weather could have contributed to the depression he suffered in his life. Finding out that Rothko attended Lincoln High School blew me away. When I consider a couple of other graduates including voice artist Mel Blanc of Bugs Bunny, Daffy Duck and many other Warner Bros cartoon characters fame and Simpson’s creator Matt Groenig; they represent a hallowed trinity of creative geniuses. These guys make me think there’s a force field within the walls of the school or a hyperbolic chamber there that shaped these minds. This theory begs for more research and a separate blog post. It might also get me arrested if I were to wander into the school unannounced, spouting such theories and making demands to complete my research by being directed to the genius chamber. This trinity idea, and in the creative world I consider it holy, may be thwarted by the possibility that there may be even more famous and weirder Lincoln graduates which would create a new theory about something being in the water from the drinking fountains creating the possibility of my being arrested multiple times for trespassing to drink from these fountains. 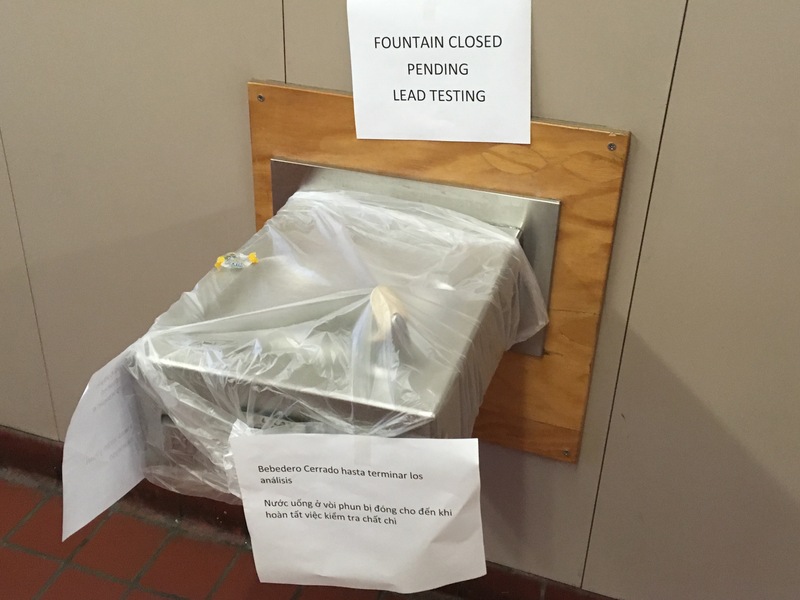 These days you don’t want to drink from any fountain in a Portland Public School due to impending lead testing. 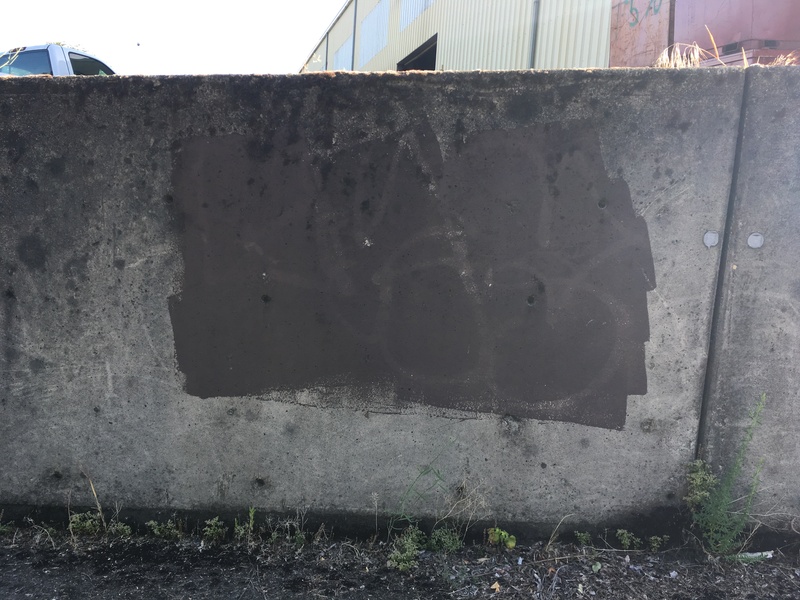 My aim is to acknowledge an accidental Rothko homage in a technique used to cover up graffiti that’s seen all over town. 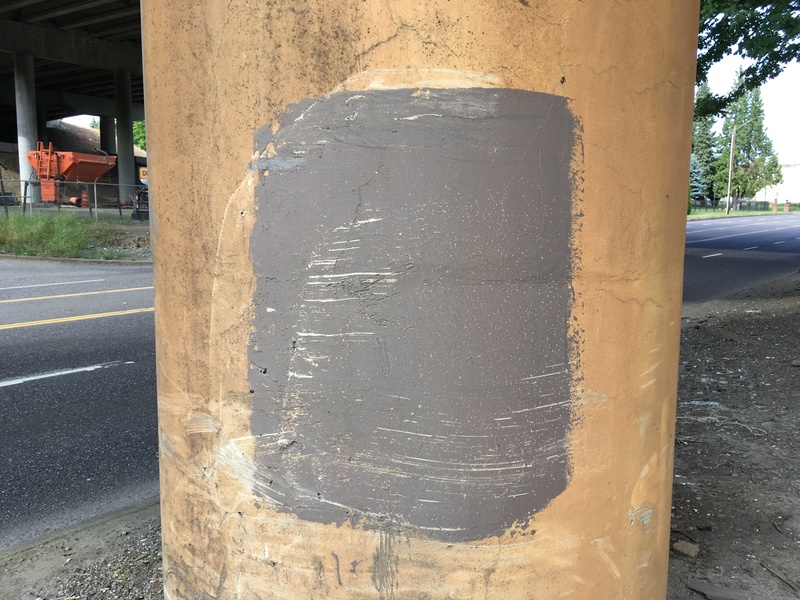 Big blotchy splotches with features from Rothko’s color field paintings are painted on building walls and under overpasses. They don’t measure up to the abstract expressionism work of Rothko, but they could be considered elementary renditions if a bit of imagination were employed. This coincidental connection is a way of honoring a man that Portland needs to claim as a favorite son. He did spend his formative years here and received most of his education in Portland before getting the hell out and going to Yale. 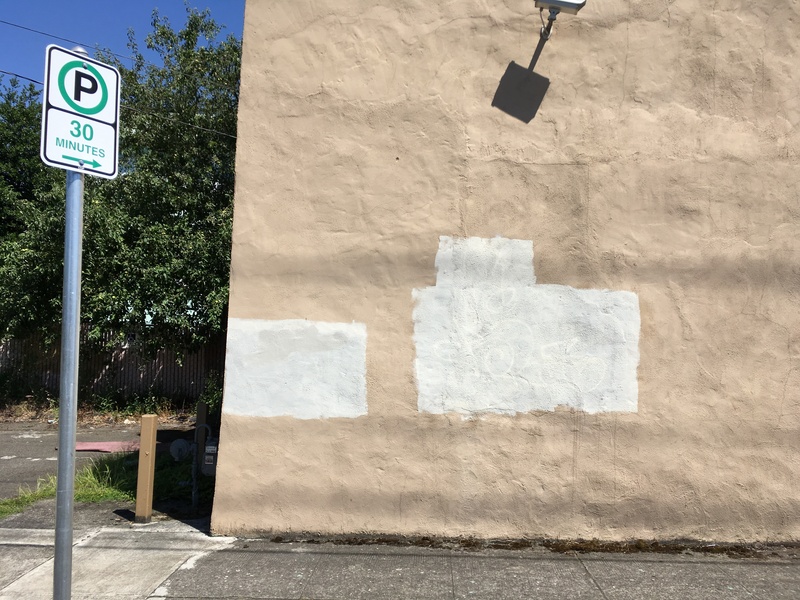 A block of paint to cover graffiti serves as an accidental nod to Rothko. It’s barely in the ballpark though because it’s rare to see the more dynamic colors Rothko preferred like maroon or orange. Instead we get industrial shades of gray, brown and beige. 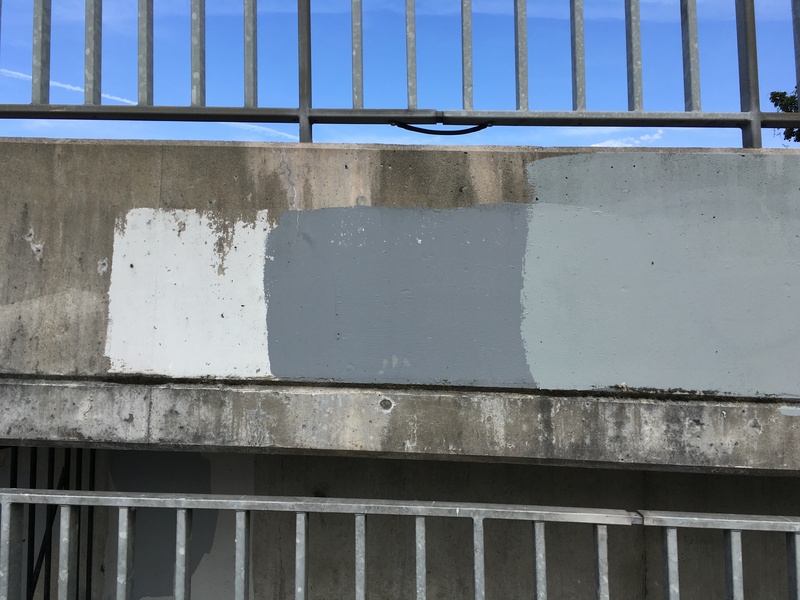 While I appreciate the efforts to clean up vandalism, I’ve never understood the idea of not using a similar or identical paint color in order to get a less Rothko result. 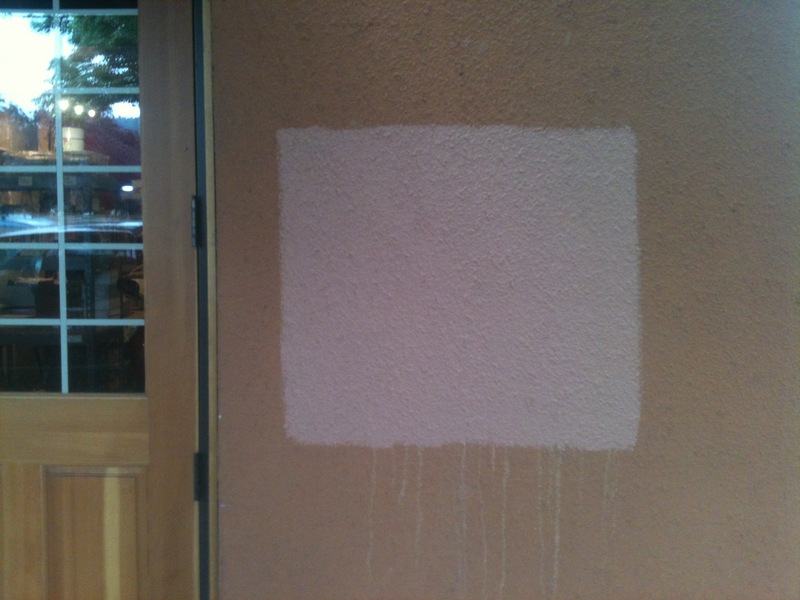 Ultimately, I like these unintended reminders of Rothko. 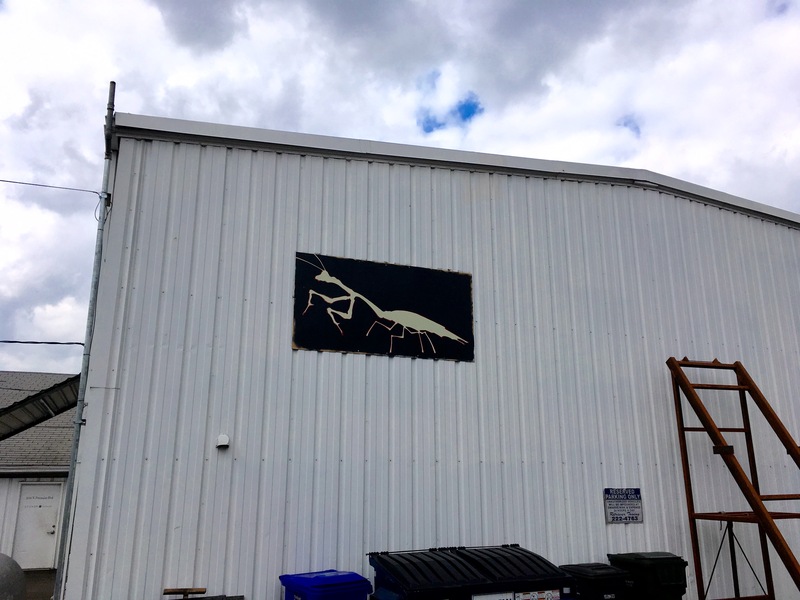 I’m left to wonder if his childhood spent in Portland inspired his art style. 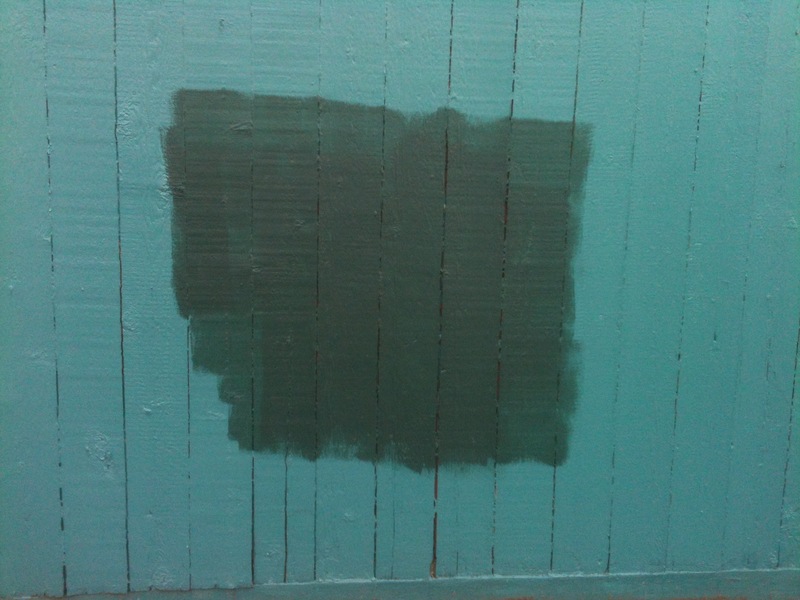 When I think of Rothko, Portland and big blocks of paint with sharp edges it all comes full circle.